When we made plans last week to see the Diana exhibit in Kansas City, we never thought of the date which happened to be St. Patrick's Day. When my friend Dana heard what we were doing, she immediately told me how busy downtown was going to be, after all, Kansas City does have the second largest St. Patrick's Day Parade in the United States. I was thrilled to hear we would be in the midst of a huge parade. I begged Bob to go and he agreed to do it. Unheard of. A last minute change of plans. We left Jeff City a little earlier than planned, in order to get a decent parking space. I had downloaded the parking areas and printed them off... and left them in the printer. I discovered that fact when it was time to decide where to park. Of course, I get out my iPhone and start downloading the directions. I had plenty of time to do it, as traffic was not moving a lick. By the time we hit the parade's beginning at 33rd and Broadway, Bob tells Ash and me to jump out of the car and start walking. He'd park the car and meet us. Ashley and I started walking through the waves of green, getting beads from Union workers and my photo taken with Charlie Brown! We finally made it passed the parade entries and decided to cross the street. One lady took exception with us crossing the street by her. I think she wanted us to stay where we were but we had designs on standing in front of the Our Lady of Perpetual Help Church. We barely find a place to stand, and we are an hour early. It was fun to people watch and about 30 minutes into the wait, Bob shows up and stands with us. He blocks the 30 mph winds that torment the parade for the first hour. We gave up and started walking to the car when the crowds got so bad you had to hold your breath to make room for all of us! It was a people watchers paradise and something I would love to do again! 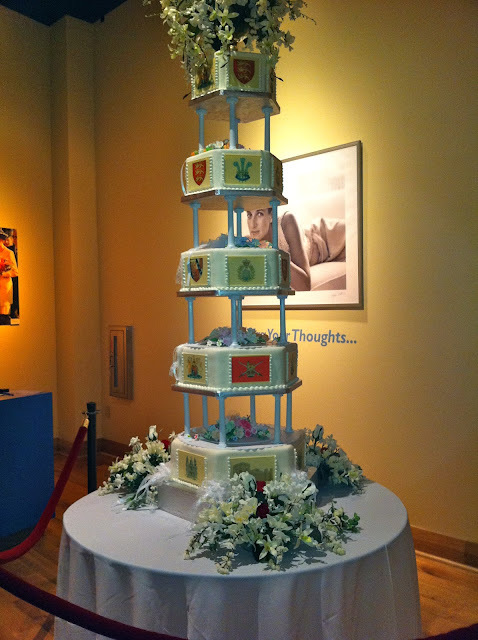 Replica of Diana's wedding cake. See her photo behind it? Sharing at the Little Red House Mosaic Monday! That was quite the adventure! I learned something new having no idea that Kansas City has the second largest St. Pat's parade; I would've thought Boston. Glad that you decided to participate at the last minute. You had such a wonderful day! I love the picture of you with Charlie!! 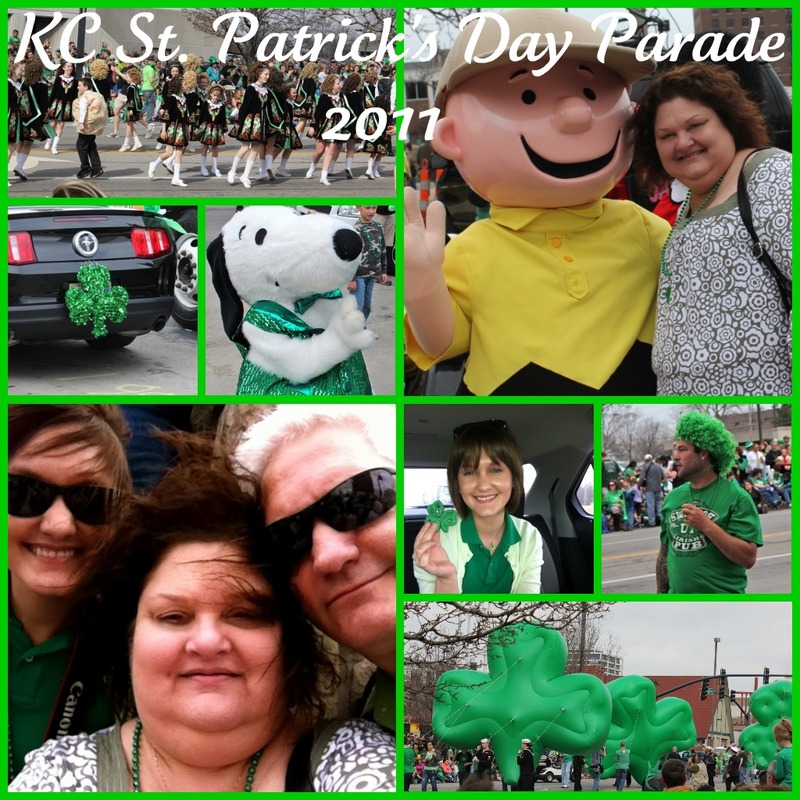 I'm so glad you got to "experience" the KC St. Pat's Parade....you are a braaave family! :) As I told you, it's been about 4 years since we attended one...it is really a fun time. Yes, the winds in KC were pretty strong yesterday...but the temps were glorious! Glad to get good feedback about the Diana Exhibit. I think a couple of my buddies and I are gonna visit it. What fun Spring Break things are on your Friday To Do List? What a great turn of events! I'm a sucker for a great parade and I too didn't know about KC's. I was hoping we could take pics of the Diana exhibit. Dang. Sounds like you are having a great sprin break!! Sprin, spran, sprun....that was supposed to say SPRING. Ohhh...I would have loved going to the Princess Diana exhibet! I bet it was fabulous! OMG...can you believe that wedding cake? My friend, you are much braver than me. I'm not sure about fighting all the crowds at the St. Patrick's Day parade! I love to "people watch" though! Hehe! Thanks for sharing your day with us! Also, wanted to thank you for stopping by my place! I enjoyed your visit and sweet note, my friend! I would love to see the exhibit. How fun to be able to do both fun things. Cute photos. Love the Peanuts characters included! Being a little claustrophobic, I am not sure I would enjoy the parade like that...I love watching them live on tv though! What a fun trip! KC is so crazy on St. Paddy's Day, even more so the years it's on a Saturday! The Diana exhibit had to be awesome!!! Looks like you have fun. Great mosaic. A Belated Happy St Patricks Day to you, what fun.